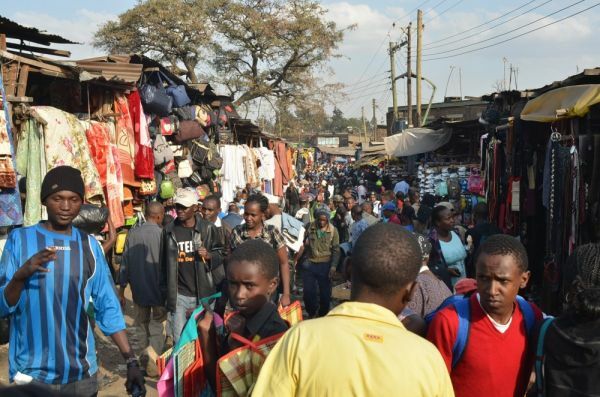 Gikomba is Nairobi’s largest open-air market. In aisle after aisle, goods of all types are piled high; venders shout prices from behind piles of clothing while buyers sift for hidden gems. 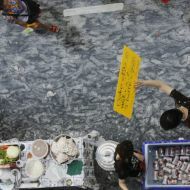 The market’s muddy pathways are crowded and shoppers are forced to make way of people hauling carts stacked with bagged-up merchandise. It’s an amazing commercial display, made all the more remarkable because almost everything for sale – from bed sheets to high-heeled shoes, underwear to bras – is secondhand. Gikomba covers about four square kilometers near Nairobi’s city center, but that isn’t enough space to contain all the vendors. 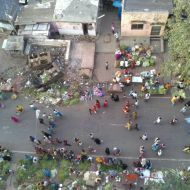 Some set up shop in the road while others drape jeans over their shoulders and wander the alleys looking for a sale. 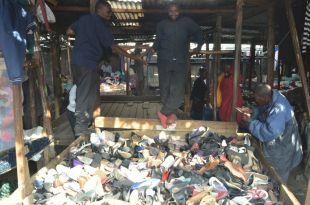 It is the heart of Nariobi’s trade in used clothing, or mitumba. The mitumba comes mostly from Western donations, intended perhaps to clothe the world’s neediest people. But instead of being distributed for free as charity, it forms the foundation of a thriving retail industry. In Nairobi alone, over 25,000 earn their livings in the transport, sorting, trade and sale of mitumba. The mitumba industry’s roots reach back to the Live Aid era, when clothing was sent en masse to countries wracked by war and famine in East and Central Africa thirty years ago. 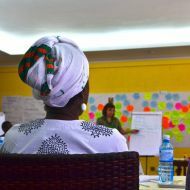 Many of these donations entered Africa through Kenya’s busy Mombasa port, and eventually found their way to local markets. This supply chain continues today. People from the U.S., Europe, and Australia give away used goods — not just clothes, but shoes, cookware and books — which are then sold at low prices in bulk to Kenyan importers. The importers bring everything to warehouses, some of which are in Gikomba, where merchandise is sorted according to quality and style into plastic and wicker bags called bales. The bales are then sold to middlemen — those with connections get first dibs — who pass them along to the venders who sell them to customers in Gikomba. 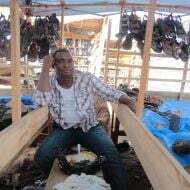 The prices are low, and the quality good enough, so Kenyans of all walks of life looking for a deal shop in Gikomba. 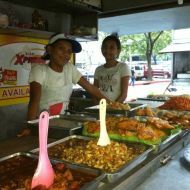 Though the market seems haphazard, the vendors pay monthly rents for their stalls and hire security guards to watch over the goods at night. Rents vary according to location, and one can find all the latest styles with a bit of searching. At one table near the edge of the market, a young vendor named Pius Masoka sold men’s and women’s jeans, with changing rooms ready nearby. American Eagle, he told me, is his best-selling brand. 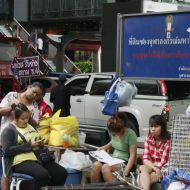 Depending on the quality of the product and the location of the stall, buyers may find fixed prices or the chance to bargain. At Anton Ngunza Sente’s shoe stall, buyers have both options. His stall looks like a mess. Hundreds of men’s, women’s and children’s shoes of different styles and types are mixed together and customers must dig to find matching pairs. Typically, that means 300 to 400 shillings per non-camera pair, a price that falls with each passing day. Large shoes are a little cheaper, while in-demand sizes, like men’s seven or eight, are more expensive. Saturdays are the busiest days, and at the end of the month, when workers receive their paychecks, Sente might open thirty bales. Still, Sente is happy to sell mitumba in Gikomba. After all, it’s a steady job. But not everyone feels that way. 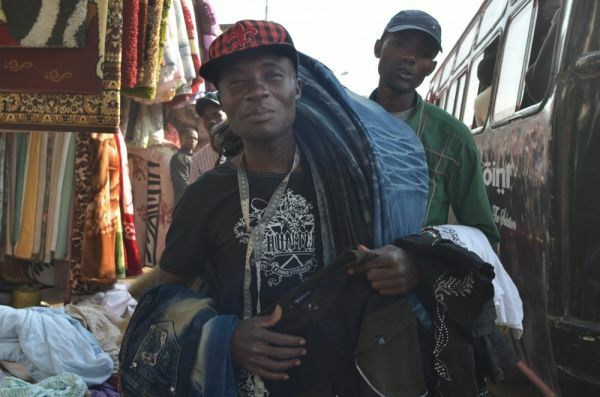 The constant supply of free goods from overseas has decimated Kenya’s domestic textile market, and an industry lobby is pushing for higher taxes on donated goods in hopes of cutting down on mitumba in favor of locally produced goods. 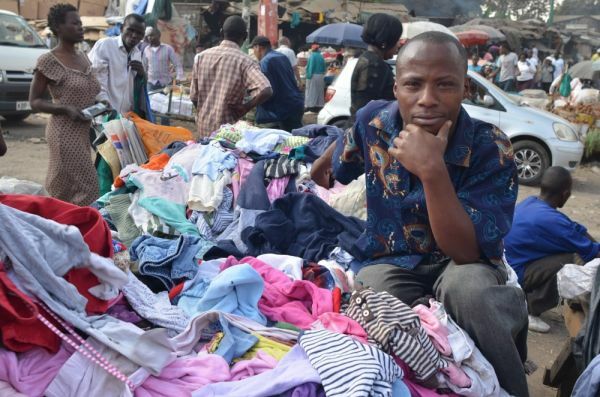 Whether such a mitumba tax will be enacted is unclear, but until then, many in Nairobi will continue to buy their clothes in what has become the old-fashioned way: From cheap used imports, repackaged as new.